Now that the league has split in half everyone is playing against some hard competition, this past week Ferencváros picked up two important wins against two teams that were right behind them after the regular season in Csíkszereda and Brasov. On back to back night the Budapest team defeated their two rivels. Leading the charge was Brett Switzer with his four goals and one assist, this is why he is this week’s Player of the Week. Brett Switzer comes from Calgary, Canada where he played his youth hockey before moving on to juniors. He played his junior hockey in the AJHL and the BCHL, mostly with the Spruce Grove Saints. During his junior career he would play with two players who ended playing in Hungary, Curtis deBruyn, Brance Orbán. He was also teammates with current Edmonton Oilers defenceman Matt Benning. After juniors when to Bentley University for four years where he was teammates with Alex Grieve who would end up playing for the Fehérvári Titánok. After graduation he played two seasons with the Dundee Stars where again his path crossed with teammates who would or have spent time in Hungary in Vlastimil Lakosil, Mikael Lidhammar, Craig Cescon. The head coach during these two seasons for Dundee was former Dunaújváros assistant coach Marc LeFebvre. 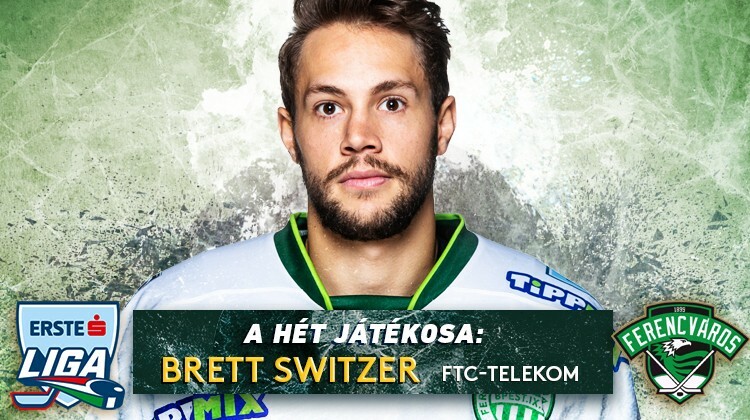 Switzer would spend one season in France before signing with Ferencváros this past summer. There is not real easy team to face this part of the season, what is the mentality like during the middle part of the season? This is the first time I have played in a league where the league splits like this. Not much has changed for us, there are a lot of hard games, it came down to the end in the regular season for us to be the top team in the standings. We were able to take this mentality into this part of the season and hope we can take this into a long playoff run. Every game is a battle to pick up the three points. Ferencváros has been at the top standings from the start of the season despite all the injuries that you had, how does a team try to overcome something like this? At the start of the season we realized that we had a very deep team that has a nice mixture of veterans and young players that have skills. When someone got injured we had players stepping up and proving that they can play. The depth really kicked in when we had five guys injured. We had players wanting to prove something, we had good coaching and good system that helped us get over the injuries. This will be a big part for us in the playoffs as well. We have four solid lines that we can put out there regardless of who we are playing. This is your fourth season in Europe, what was the biggest reason that you decided to play in Hungary? I was actually thinking about retiring after last season, I was unsure what I wanted since I am getting older and I had fun the past few years, but I got a call that Fradi was interested in me. I had talked to some guys that I knew who had played in the league and heard good things about the club. The city of Budapest was a factor as well since I knew more about the city than the league. I also talked to the Fitzgeralds since they had already signed with the team, I knew that they are quick exciting players and I thought it would be something fun to be apart of. I could not be happier with my decision to come here to Fradi this season and it has been a blast. What has surprised you the most about the ERSTE Liga that you were not expecting when you had signed? Compared to the other leagues I played in the younger Hungarian players are very skilled. In the other leagues the local young players where not as developed as they are here. The abilities that the young players have here not just in Fradi and the impact they have on the game is very impressive. This actually helped us this year when we had experienced players out with injuries. Ferencváros still has four games left, what does the team have to concentrate on to hold on to first place in the standings? We have some players coming back from injuries, we just need to focus on maintaining good habits and concentrate on what has gotten us this far in the season. It is important to go into the playoffs on a highnote and to be hot. The first four games of this middle part worked out well for us, now we need to keep this going in the next four and keep on going when it becomes real important in the playoffs.